MY NAME IS LOVE AND LOVE ALONE! The overloaded passenger van was moving at rocket speed when the wailing voice of Allah Ditta Lonaywala “Assañwich Ishq de rull gyay haañ” struck my ears. Coming out of a noisy car stereo it makes me think of the spiritual reunion; of Heer and Ranjha and wonder if it were we who are lost in love! I got off from the van a few kilometers ahead of Jhang city as the young conductor pointed towards a dusty street surrounded by a thick cluster of shrubs, “that will lead you to the tomb of Heer Ranjha”. I adjust my worn out travel bag on weary shoulders as I delve into another spiritual quest, into the realm of unrequited immortal love between the two legendary lovers of Punjab, Heer and Ranjha. A deep hush greeted me when I glimpsed the green colored doom across a dense cluster of wild shrubs scattered in the adjoining graveyard. Climbing a few concrete steps I reached a marble floor guarded on all sides by iron fence and the white, blue, green tiled tomb stood humbly in the middle of it. Had I been here before in another place and time? A déjà vu engulfs my being! 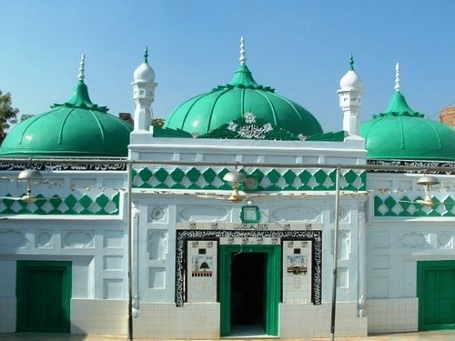 Everything looks so familiar, the environment, the canteen and the white and green colored mosque with its abandoned grace, a deep and pure silence occasionally broken by the sobbing young girl who placed her head on the marble slab of Heer Ranjha’s grave perhaps seeking some solace for the pain that her lost love caused. 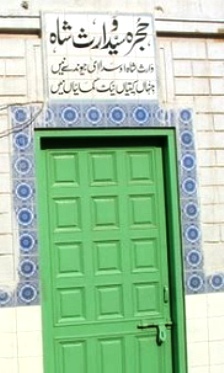 On right side of the tomb’s main entrance a limestone plaque reads, “Darbar Ashiq-e-Sadiq Mai Heer wa Mian Ranjha”. I read on and on, “Asihq-e-Sadiq [True Lovers] and felt some very sacred presence all around the place. Jo bhi kuchh hae, muhabbat ka phailao hae [everything here…is nothing but a span of love]. Annemarie Schimmel, a renowned orientalist writes “Heer Ranjha has been elaborated in more than a hundred versions, in Punjabi, Urdu, Sindhi and Persian. Originally some characters depicted in the Heer were from Punjab’s socio-religious mix, however, gradually the work took on more of an Islamic assertion and by the time version of Ahmed Gujjar came on the scene (1693) Ranjha got portrayed as a Muslim defending Sufi concept of love against asceticism of the Naths. Sufi poets elevated mortal love to the level of spiritual love and the qissa of Heer Ranjha took a pre-eminent place in Punjabi literature, the Syed of Jandiala, Suzanne McMahon writes, “Waris Shah’s Heer is widely regarded as the most brilliant rendering of Heer Ranhja.”It is the story of a young man and a young woman deprived of a societal sanction”. Heer [Izzat Bibi] was a courageous and daring young girl, the daughter of Chuchak Sial and Malki from Jhang. Her courage was elaborated in a qissa, a narration: Sardar Noora from Sambal community had a slave named Luddan. Due to maltreatment meted out to him, Luddan ran away with Sambal’s beautifully crafted boat and begged shelter from Heer. Heer helped him. Sardar Noora enraged by the incident approached her who gathered her friends and confronted Sardar Noora. Heer ultimately triumphs. When Heer’s brothers learn of this incident, they are furious and express their concern, “you fought alone sis, why you didn’t send for us?” Heer replies, “Why should have I? It was not Emperor Akbar who attacked us”. Ranjha [Mian Umar] was the youngest of his brothers in Takht Hazara. After a row with his brothers, probably over distribution of inheritance; he left home and to seek his fortune wandered with a flute under his arm; finally reaching Heer’s village. On the way he encountered a narrow minded Mullah who didn’t allow him to spend the night in the mosque [saying ashiq, bhor, fakir te kutay – lovers, the insects, beggars and dogs were not allowed to enter the mosque]. Luddan, the former slave too refused the penniless wanderer to take him across river Chenab. Ranjha lured Luddan’s wives and Luddan agreed to take him across the river to get rid of the situation. On boat Ranjha slept on a comfortable couch which was the property of Heer. When she learnt that her couch had been defiled by some unknown Jat, she rushed to river Chenab to taunt Ranjha, but her anger evaporated with Ranjha’s words, “Vah Sajjana!” and they were lost in each other’s eyes. Ranjha murmured to Heer “life is only a dream and you must abandon the pride of youth and beauty and be prepared to leave the world”. 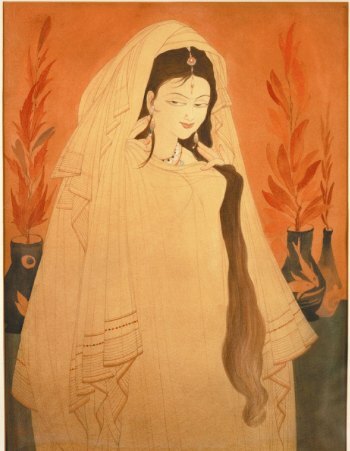 Heer was hypnotized by the way Ranjha spoke and while he played the flute, eventually she fell in love with him. 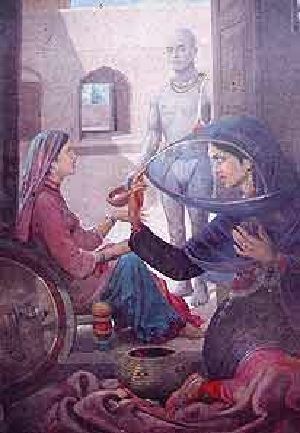 Ranjha asked Heer to pledge for love and become immortal. To claim nearness to her lover, Heer offered him a job to take care of their cattle. She promised to sacrifice everything for love and even to lay down her life. Broken hearted, Ranjha left on his own until eventually he met a Jogi. Wherever he looked, he could only see his departed love and being emotionally scared he voluntarily became an ascetic too. Heer could not forget Ranjha either. She sent a message to him and he came in guise of a Jogi to take her away [they escaped with help from Saida’s sister Sehti]. When Heer’s parents became aware of the elopement they repented and asked her to come back so they could arrange her marriage to Ranjha. The lovers returned to Heer’s village, where her parents agreed to their marriage. On the wedding day, Kaido, the sinister uncle poisoned Heer so the wedding wouldn’t take place. She was buried in Ranjha’s absence. Ranjha learnt of her death, grieved and dejected he rushed to his love’s grave and prayed to be with her. Miraculously the grave parted and Ranjha laid himself down beside his beloved Heer in their eternal sleep. The beginning of Ishq-e-mijazi led them to the status of Ishq-e-Haqiqi and they were declared Pirs and Fakirs at the young age of 32 and 36 years respectively. Syed Abid Hussein, caretaker of the tomb, finished the legend of Heer Ranjha and I recovered from the trance of an enchanting tale of love. A simple man, Syed Abid looked at me with gloomy eyes, “Is God not a lover?” he said, “Is universe not created out of love? Ishq has uncountable colors and forms. Is everything not Ishq?” I agreed. Ishq was everything, it was everywhere. “Can my love for a woman lead me to God?” I asked. A few paces away the young girl sat curled up with her head against marble slab of the grave. She had stopped sobbing somewhere in the middle of caretaker’s narration of Heer Ranjha, but her eyes were still soaked with silent tears flowing down across her neckline. She kept staring blankly into something unseen. With my back resting against the tiled wall I witnessed everything. A bare-footed old woman walked in. Went to the grave and kissed it affectionately. Wrinkles filled her face like cracked lines over a parched soil. She performed some secret ritual by closing her eyes and clasping her hands for several minutes. Then like a whirling wind she began to dance in a trance. Her bare feet struck the floor with a loud thud, providing beat for her dance, yet I could see the rhythm was from within. “And where are their souls?” I asked. Rañjhañrh mera, maeñ Ranjhañ di, …. To whom I belong and who to me belongs. Umair Ghani is a Pakistani freelance photo-trekker & writer. Umair enjoys freedom of the road & the joy & thrill of adventure. Stung by his wanderlust and a passion for everything that’s beautiful, he began wandering in the Himalayas and the Karakorums and quit teaching for photography and writing. This is all true. Any word which is 100% truth is the word of Allah so respect that. If love is true then it passes its message, Allah does this job for a true lover. HE HIMSELF becomes a friend and a messenger, always rememeber, this world is nothing except like a play, so Allah will allow true lovers to live happily ever after, on the day of Judgement, then every one will look at them with open eyes. And will be witness to their eternal reunion. Nice topic, beautiful writing and excellent effort. Thank you for doing this for us. Much appreciated! I really love the story of heer ranjha. IT IS A SIGN OF PRIDE FOR US THAT THESE KIND OF LOVERS BELONG TO OUR PAK DHARTI. SO WE HAVE TO RESPECT THE TRUE LOVERS AND TRY TO HELP THEM FOR THEIR LOVE. “je tu Rabb nu manouna pahle yar nu mana”. Do not know why did we separate ……..apart from that we all are like fishes in water yet all are thirsty. Allah, Krishna, Christ, Budhha, Nanak all are 1. Although we have to live whatever way, wherever we are, going by the time, I just pray to Almighty, have pity on us……. I love Hazrat Muhammad (peace be upon him) and I love dear ALLAH.We should do all good deeds so that our life is spent in the path of ALLAH and His love. In my opinion this piece of writing is simply superb. Very contemporary yet very nostalgic. Sometime, it made me happy yet sometime made me sad. And that is the beauty of Love in its realm. Heer and Ranjha, you will remain in our hearts forever ! By the way, my friends, please do watch Heer Ranjha (1992) Hindi Movie *ing Anil Kapoor and Sri Devi, to cherish Heer & Ranjha even more ! My respects to Heer Ranjha. May Allah make both souls one. Aameen! Allah in roohon ko ek roooh karde. Aameen! i just heard this legend last night and the one which i was told, just enamoured me, i cannot express what i felt. beautiful. Its an old story of eternal love when earth was loaded within its carrying capacity. Yet this story of love is revisited each time in current age as well for love is eternal and so is the passion of love in lovers..
Now there is a need to redefine the love in present context …..? ……Dil ka her aik gosha hai veeran, tere baghair. A real Love story remaining forever in my heart. .Ranjha – the Pride of Punjab, who thought, talked n taught abt love and love alone. Harpreet, the borders between Indian Punjab and the Pakistani Punjab are artificially real and realistically artificial. I say so because geograpahically there were no borders between the two parts of Punjab before 1947. However, much water has flown down the bridges of the five rivers of Punjab since 1947 and the border at Wahga now is the real border and it will stay so. But even with these borders there is nothing that can or that should deterr the people on either side, if there were no complications from the two governments. Its better to have borders that ensure peaceful coexistence between the two countries instead of having no border with perpetual hostility. That’s more dsngerous a scenario than the present position which is based on realities. The heritage between the two parts of Punjab is a common heritage which people on both sides of the border rever and love very much and this spirit should be nurtured irrespective of which side of the border we live. mesmerised I am. !! Thank u Author ! longer retain the learned skills but also get the precious tips and tricks to heighten your performance to an optimal level. to your PC. Windows XP was released in the fall of 2001 while Windows 7 was released in October of 2009.
it sure it has atleast one GB RAM house obtainable. Now that yoou have a Windows 7 computer, how would you connect your wirelsss devices which are Bluetooth enabled, to your PC. This is the same as the WINDOWS+UPARROW keyboard shortcut. Breathtakingly beautiful story of the eternal lovers. Mai Heer grave yard is inspiring. Let’s pray for both souls to meet and live together in peach in the after life. Inshallah. @ Nabila, I too say Aameen! I wish I could visit mai heer’s tomb sometime. I pray Mai heer to call me. A wonderful write up which describes beautifully the presence of “heer ranjha” a divine communion. Thanx Taj Manchanda. Of course you are welcome to visit the tomb of Mai Heer’s tomb in Jhang city of Pakistan. If you have a firm mind, then you be rest asssured Mai Heer will definitely call you.